When a plant does well in my garden, I want to grow more of it. As a gardening strategy, this makes perfect sense. So often we struggle on, trying to grow things that are not best suited to our conditions. Then we ask ourselves why we fail. I wonder how many people have abandoned gardening based on failure to maintain a baize-like lawn, a compact lavender bush or some tender beauty pushed to the front of the garden centre bench? My sincere advice is not to bother in the first place. Unless you are very skilled, very determined or very fortunate, you are heading for bitter disappointment. Celebrating and building on what grows well in a garden is a sound philosophy. That’s why my tiny plot is rammed with agapanthus, zantedeschia, hedychiums, begonias and cannas. Hey, I should probably up sticks and move to South Africa or South East Asia rather than soldiering on here in East Kent! On many occasions over the last decade I have planted coleus in my garden, usually in pots. Provided they are a decent size and adequately hardened-off they perform brilliantly in my cool, dappled courtyard, rewarding me for months with boldly splashed, feathered or bordered foliage. 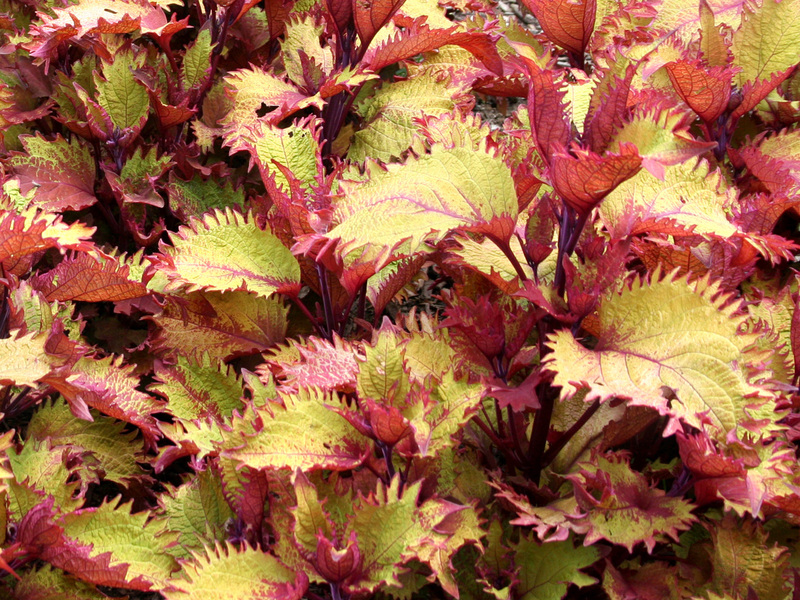 When it comes to vibrant, even zany leaves, coleus have few peers. I adore them for that. The nondescript flower stems, mauve and elongated like a poor-man’s salvia, are normally pinched out to extend the foliage display. This does eventually become something of a futile task, but cuttings can be rooted in a glass of water and vigorous replacements created within weeks. Coleus can be grown indoors or outdoors, appreciating a degree of protection from scorching sun and benefitting from regular watering. This summer my local garden centre is offering an irresistible coleus (now correctly reclassified as solenostemon), named ‘Henna’. I’ve now purchased ten of them, and they were cheap at half the price. Already substantial plants, they have doubled in size over two weeks and everyone is commenting on their bold, tooth-edged foliage coloured Chartreuse green and brick-red. ‘Success!’, I think, ‘I’ll get hold of some other varieties’. 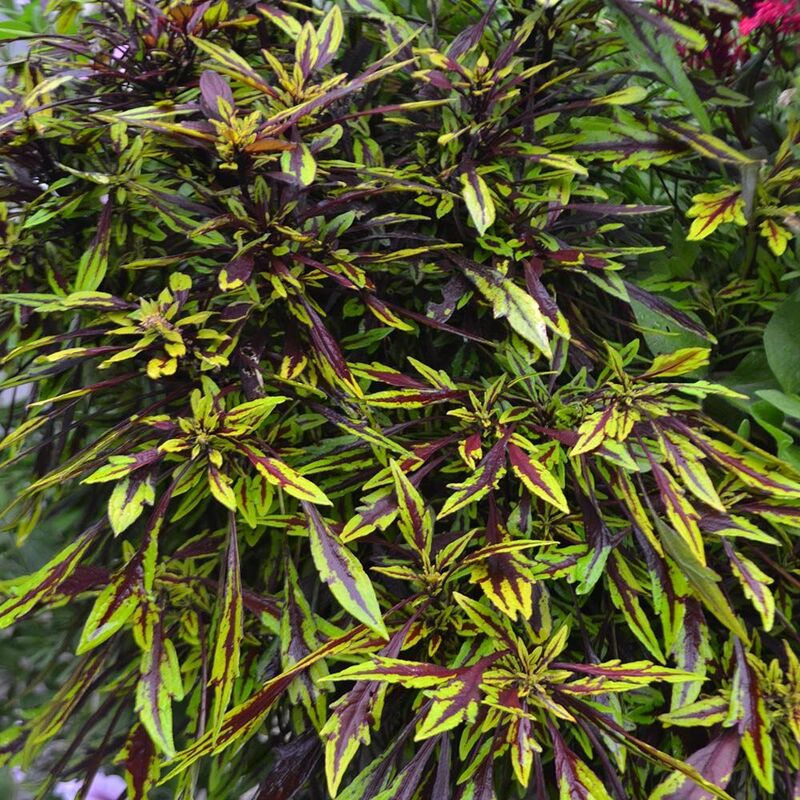 I search my mind and recall a cultivar named ‘Gay’s Delight’ (can’t imagine why that stuck with me), an acid-yellow coleus with dramatic black venation. I grew it at some point over the last decade at a time when I didn’t have a greenhouse to keep tender plants alive over winter. I Google ‘Coleus Gay’s Delight‘. The RHS website lists a single supplier. A single supplier, for an easy-to-grow plant with an Award of Garden Merit? I am surprised. I click-through to Primrose Cottage Plants in Cheshire and find a photograph of ‘Gay’s Delight’, but no further details and no means to buy. Unperturbed, I return to the RHS website to see what varieties might be more readily available. Perhaps I had been searching for the rarest of all coleus …. which would be typical of me. Ahh, yes, 431 results for solenostemon. Brilliant. Then I begin to scroll through the list. The first variety, ‘China Rose’, is a classic coleus with beefy, burgundy, serrated leaves, each with a fuchsia-pink flash down the mid-rib. It also has an AGM … but no suppliers listed. Odd. Next up, ‘Buttermilk’ is a slightly tamer creature with lemon-yellow leaves generously edged in Granny Smith green. Also no suppliers listed here either. Number three is ‘Campfire’, shortlisted for the 2016 RHS Chelsea Flower Show Plant of the Year and winner of the People’s Choice Award for best new summer flower in the same year. Not bad for a plant that isn’t grown for its blooms. Two suppliers this time. Really? Only two? Primrose Cottage again, and Hillview Hardy Plants who actually do appear to have plants available at £8 each if you search really hard for them. Mildly encouraged, I continue scrolling down the RHS list. On the first two pages, only the cultivar ‘Henna’, which I already have, has two suppliers listed, the rest have none or one. By page three of forty-two, the RHS do not even display a photograph. Now feeling slightly irritated, I return to Google and search ‘buy coleus plants UK‘. First up come Dibleys Nurseries, best known for their splendid offering of streptocarpus and begonias. I shall return to them shortly. From then on the top results are all for seeds or plug plants of mixed varieties, which is a result, but not the one I am after. Like many budding gardeners I grew coleus from seed when I was a child, and still recall the experience vividly now. 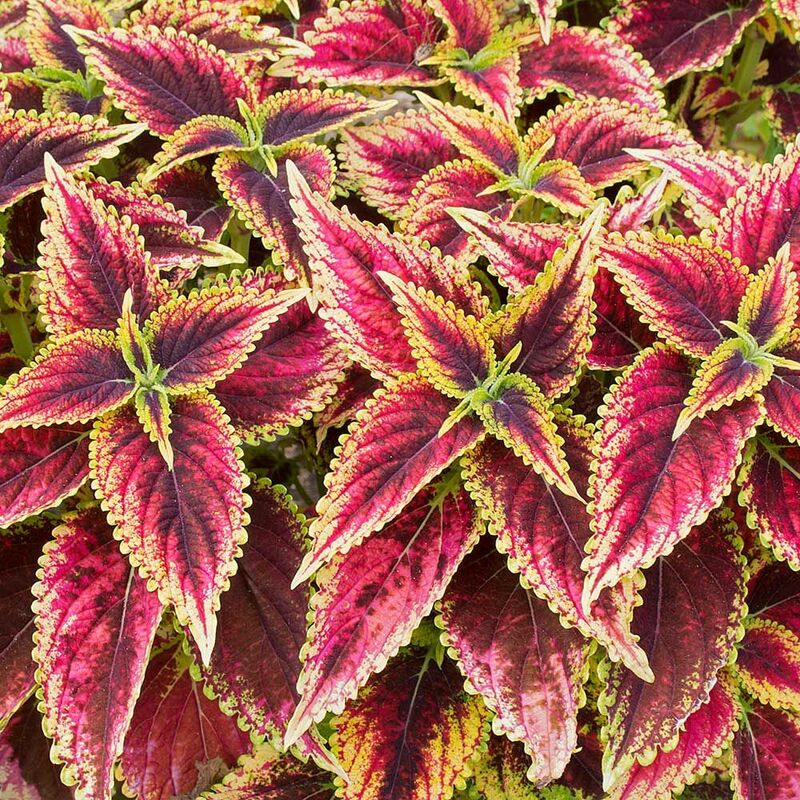 While the flowering plants would take weeks to start doing anything interesting, coleus would begin to produce colourful foliage immediately after the seed leaves. Even these might be speckled or bronzed. 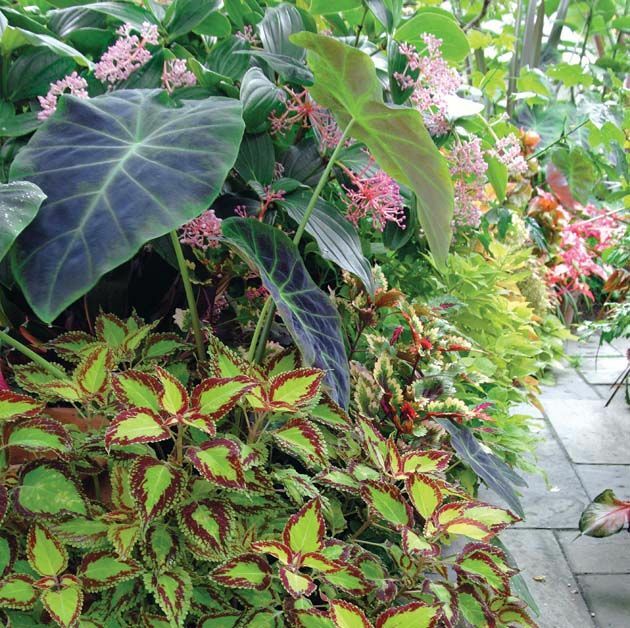 Coleus provide as close to instant gratification as any plant grown from seed. 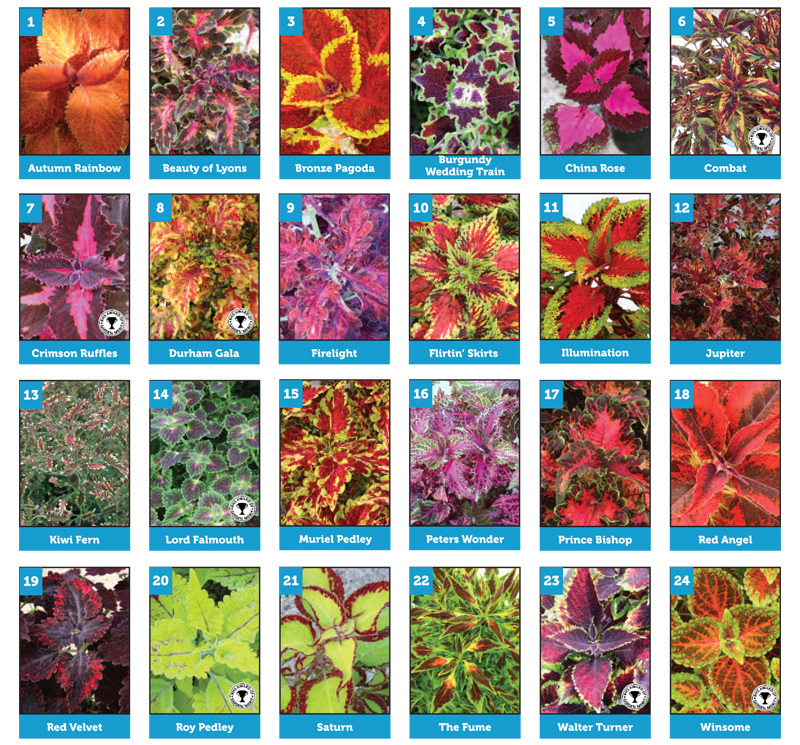 Too late to start from scratch with seed and too fussy about what colours I might receive in a mixed tray, I click through to a website called Coleus Finder. Created by enthusiast Wouter Addink, Coleus Finder could well be to coleus what the Millenium Seed Bank is to preserving genetic diversity. It lists 570 coleus varieties from ‘Alabama’ to ‘Zebra’, each with a photograph (RHS please note). The diversity of form and colour is incredible and by page two I am salivating. 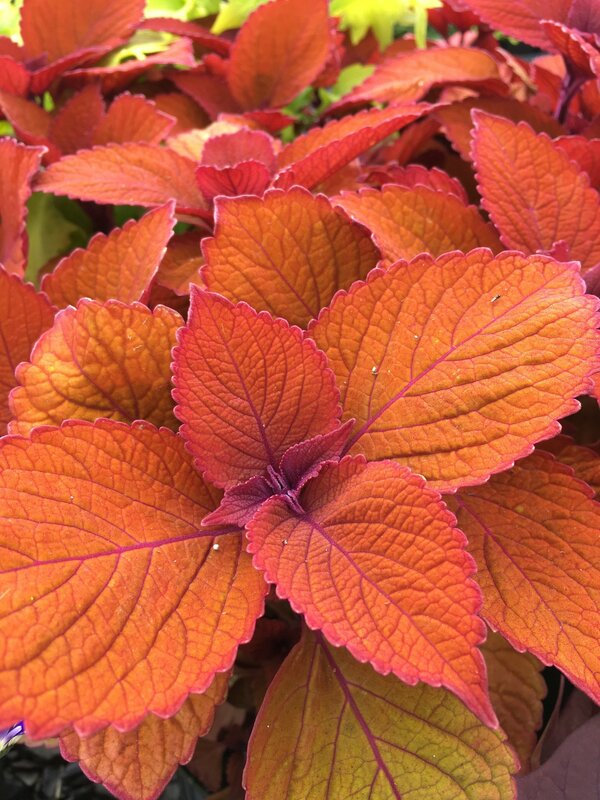 A helpful list of suppliers from around the world leads me to believe coleus might be considerably more popular in the USA than they are in the UK. Most of the suppliers listed on this side of the Atlantic are either seed suppliers, out of business, or do not offer mail-order. Another dead-end as far as my purchases were concerned. 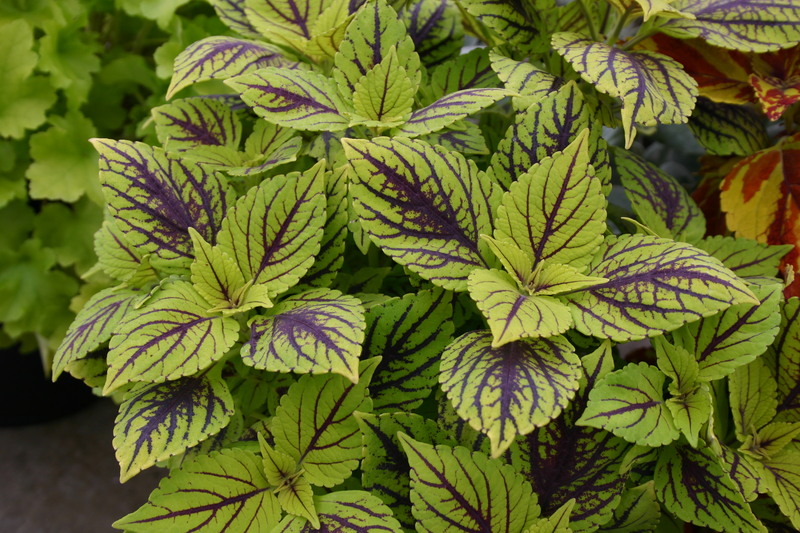 J. Parker’s offered some hope of obtaining ‘Campfire’ and ‘Gay’s Delight’ as part of a ‘unique collection of coleus that demands attention in any garden‘, but were out of stock of all coleus, even cat shoo, Coleus canina, which is good for only one thing – deterring cats. This is exactly how I hope my garden might look in a month or so! I return to Dibleys Nurseries, which I was avoiding until this point because they only supply coleus as part of a collection of six, twelve or twenty-four plants, albeit one can select from named cultivars. I love Dibleys but the ordering process was not smooth, and the varieties available differed from the miniscule photographs displayed. None of them were coleus I was especially looking for, but by this point I was not going to be fussy. Dibleys provide no indication of what size the plants might be and no individual descriptions of the cultivars on offer. Having had a couple of glasses of wine by this stage, I decided on eight varieties, three plants of each. I figure that any I don’t like can be grown on and sold at my garden open weekend in August. Knowing me I will love them all. The list includes ‘Autumn Rainbow’, ‘Combat’ AGM, ‘Kiwi Fern’, ‘Durham Gala’ AGM, ‘Lord Falmouth’ AGM, ‘Pineapplette’, ‘Winsome’ AGM and ‘Walter Turner’ AGM. When they arrive, I shall provide a full report. My experience leads me to believe that coleus are in crisis here in Britain. As far as I can determine there is no National Collection, nor specialist grower in the UK. I can find only two books on coleus, both long out of print but now on their way to The Watch House library courtesy of Amazon. 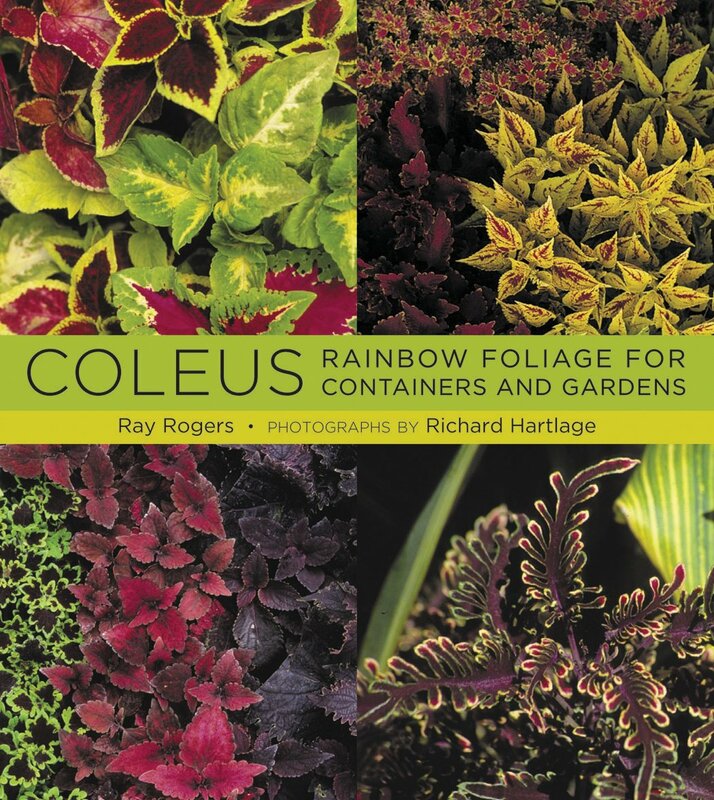 The more recent title, published by Timber Press in 2008, heralds coleus’ dramatic comeback. If it happened, I blinked and missed it. The earlier volume, Coleus: A Guide to Cultivation and Identification was published in 1974, which must be approximately the last time anyone here took any interest these poor plants. 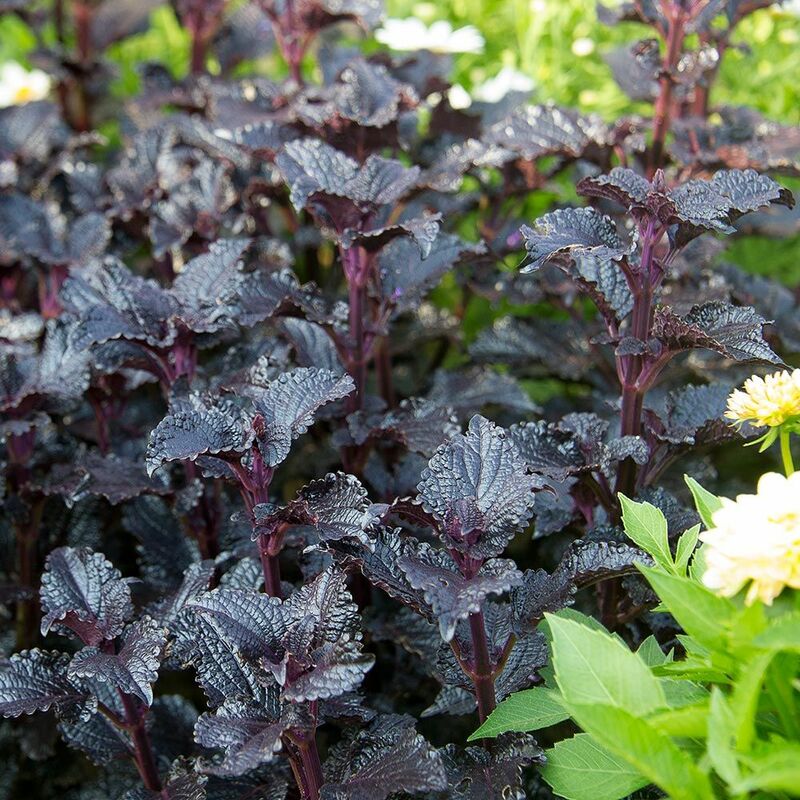 The majority of coleus offered for sale in the UK are presented as mixed bedding for the end consumer, or as wholesale plug plants for nurseries to grow on. Where they go after that, heaven only knows. In an age when house plants are back in vogue and we’ve reconnected with the flamboyance of flowers such as the dahlia and the gladiolus, why are coleus still consigned to the Z list of cultivated plants? They may not be hardy, but the range of leaf shapes and colours knocks the much adored hosta into a cocked hat. Coleus need a champion. I might even feel compelled to be that champion if my new purchases do well. I shall be dropping Wouter Addink a line to get his advice, that’s for sure. Join me, and give a coleus a chance. Of course, what will happen now is that I will stroll into Tesco this evening and find huge trolleys of wondrous coleus for sale, or you will all comment and tell me there’s some secret source on the dark web that I should be visiting to satisfy my new-found craving. Should either happen I’d be very happy. Come on, prove me wrong …. or better still send me cuttings. Save our Solenostemon! 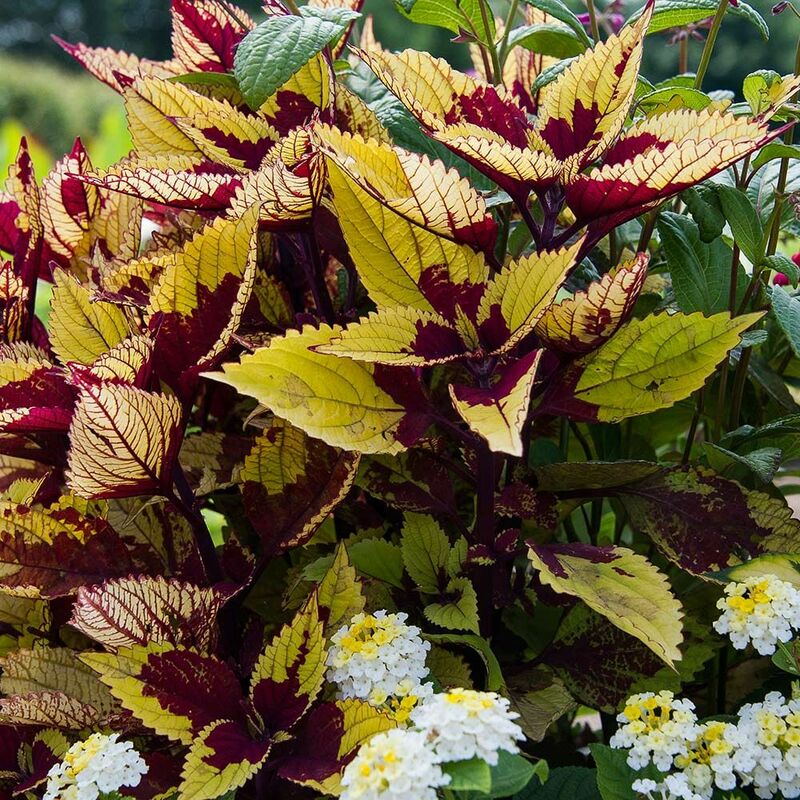 Three Cheers for Coleus! I will save you from oblivion no matter what. TFG.